There is a sensation that I feel, maybe that many of you feel in observing the path the early Nick Land trod. It’s commonplace to observe a kind of distance from Land’s political alignments of more recent times. I feel a sense of agreement with the distancing and that there are a variety of seriously flawed thoughts that are taken as self evident in this thought. As with Heidegger though, the flaws don’t outweigh the contribution. The thread I want to comment on here regards the feeling I mentioned at the start. This feeling is one of recognition. Already I’m aware this is dodgy ground. I have no particular status in the philosophical theory world so it sounds like an awful hubris. It isn’t meant to and I might even be wrong -feelings are often projections and themselves flawed in this way. I’ll try to avoid the hubris claim by explaining what I mean. I think the seed of almost all the Landian project (in its hyperstitional CCRU glory) is in his little paper on qabalah. It is hard to write any of this and do justice to the matter. The suggestion though, is that Land has experienced a confirmatory synchronistic experience to the syzygy pairing of the single base 10 integers or other related numogrammatical work. Equally it may be (and strikes me as more likely that) in attempting to contact the outside through various means he disclosed this information and founded the system after the fact (the issue is confused by the CCRU usage of time, which might suggest the after the fact normal time discovery was its retro temporal inception). This Land rightly notes is quite impressive. Let’s take it in. Either the syzygy pairings can be derived straight from the arbitrary length of the words of the numbers or they confirm them. Either way this is an impressive synchronicity that crosses the number-word boundary and intimates (as Land notes) a clue about the relation between 8 and 9. Marko Rodin would raise an eyebrow for sure. He calculates an approximate probability which doesn’t make it seem outrageous. Except of course it is pretty outrageous. Even if his calculation holds up we still have the fact that this entity (Land) with this research program (such as it is) received this confirmation. Such intimations have elsewhere certainly been held to be absolute confirmations of the truth of religious paths. Here though, the chaos magickal insight seems to be held up and no universal level of significance is attributed. Instead this connection is used as part of the apparatus to hang the rest of the numogrammatical machinery off. Yet I feel (and this is the resonance part) the numerological insight to be the driver. I feel it has this role precisely because of the actual exhilaration that such disclosures can impart to the experiencing being. The work at the CEO is almost entirely about that moment and its implications: we exist happily in a solid reality and yet sometimes things happen that show massive cracks, thankfully due to probability we can assimilate the cracks into the solidity, yet the nagging sense that maybe they really were cracks doesn’t leave -some of us. I think Land, probably along with a variety of other synchronistic type experiences, despite the flatness of his tone, feels the [p]numinous glow of his little numerological disclosure. I might be projecting but I think there is a resonance with my own ‘disclosures’. Originally (many years ago) a series of naive occult experiments furnished me with two things. A spirit named Jupiter and its number: 47. These made no numerological match in letter translation but a series of endless numerological investigations produced the following system. The foundation of the system is derived from the following squaring of base 10 coupled with the classic numerological process of cross addition formalized as n+ e.g. Now in some book or other (I think by Tony Willis) I once read that ‘the highest incarnation of a number is itself multiplied by itself (squaring) and reduced (cross addition). This rule was taken to heart at the time and thus the results were felt to reflect a significance that chaos magickal insights would later show for what they are. Nevertheless the experiments were interesting and convincing in a similar wise to the numogrammatical confirmation. Thus from this perspective, taking this rule as truth, the highest manifestation of the numbers is 1, and oscillation of 4v7 and 9. Of course like Land I’ve been stuck here with the privileging of the tellurian/mercurial numerology (addition/multiplication), something we’re working to correct slowly. The above however represents a significant synchronicity insofar as I had the 47 number first then discovered the pattern after (I knew nothing about Pomona in these days at all). Synchronicity 2 also turns on the tellurian/mercurial systems but is in a sense more impressive. 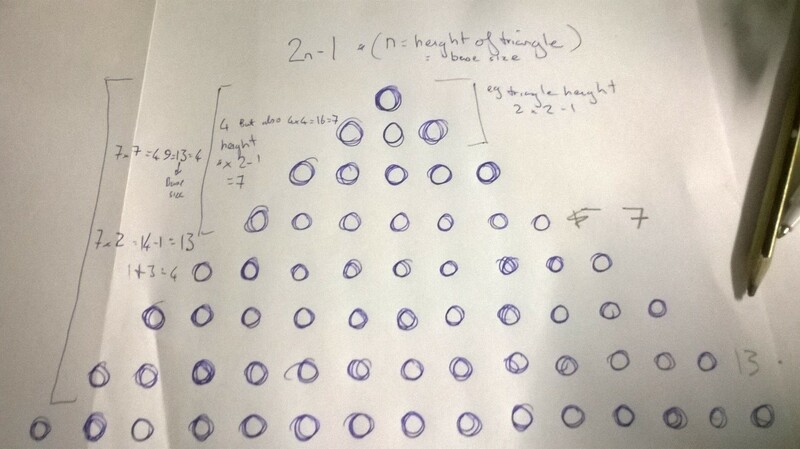 Consider that cross addition ((123)+=6) suggests the possibility of a relation, indeed says that under certain condition (a particular base) there is a relation between a number higher than the highest single integer and one of the single integers. The general impression would be that this is in a sense arbitrary or at least meaningless. What has 53 e.g. got to do with 8? Very little other than the cross addition relationship. What is truly fascinating is the that the squares of 4 and 7 give numbers whose cross addition then has a demonstrable reality in a triangle comprised of units 1 at the top 3 on the next line down, then 5, 7 and so on. Triangles of this kind of unit construction are remarkable as they also provide squares. The number that will be squared is the height of the triangle. So if I have a triangle of 2 height, the total number of units in the triangle will be 4, if 3 it will be nine and so on. The relation to the issue of cross addition is as follows. If I have a triangle of a height of 4, necessarily it will be comprised of 16 units. The base however will be 7 units(1+6). There is one relation uncovered here for the base will always have the relation to the height 2n-1. If the height is 12 the base is 23 and so on. The second relation that is more interesting to us here is the one concerning squares. Squares of 4s and 7s even of cross addition ones will always reduce to 7s or 4s respectively but the base seems to often (though not always) reveal a relation between the number itself, the square and the cross addition of the square. 13 becomes 169 becomes (curiously by preserving the first two digits as a whole number) 16+9=25 is the base number. 31 gives us 961, if we cross out the 9 for 9=0 in base 10 cross addition we immediately have the base number again. 25*25=625=13=4, or course the 7/4 transformation is preserved but the base relation is not. The base would be 49 and 625 does not have a relation to it. And no doubt there are others. How can a supposedly arbitrary number like 13 that has no relation to 4 in itself (as base 10 is arbitrary) have the above demonstrated level of necessary connection? This second confirmatory synchronicity can easily leave a person obsessed with the significance of what they’re doing. Thankfully books like Cosmic Trigger 1 quite easily help sort this kind of problem out (Clearly Land new these works well though their significance for his work seems to be largely overlooked). The CEO doesn’t have and isn’t likely to have the clout that the CCRU generated and they are quite different projects. What I feel is that there is a potential similarity in how the synchronistic background drove the philosophy that followed. Next Next post: Explorations in the Vector Field: Notes on Logic.